Richard joins our Public Sector Account Management team, liaising with NHS trusts, police forces and local councils customers on their interpreting projects. Previously, Richard worked in our Interpreting Operations & Commercial Sales departments. Capita was recommended by a friend who already worked here. I was working late nights in my previous job and wanted a more structured working day. The office is only a 10-minute drive from my home and the job description seemed interesting. I have a background in customer-facing roles, which vary from having my own business teaching guitar to working in the restaurant industry. Why did you want a role in Account Management? I really enjoy liaising with different parties and building relationships, inside and outside of work. I also like the sound of my own voice a little too much! What would you consider to be your biggest success? It may not be the biggest, but the most rewarding was taking several students from complete novice to assured guitarists, able to learn and compose material without my help. I also organised and attended a meeting in Germany a number of years ago with a large supplier, which resulted in a number of logistical improvements for the company I was working for at the time. What do you find particularly challenging in this industry? Managing expectations for both public sector and commercial customers can be tricky. Both translation and interpreting can often be an afterthought for some clients, and our processes are often not fully understood by those new to the industry. This is something I endeavour to improve. On the pyramid stage at Glastonbury (fingers crossed!). The ability to learn and evolve every day. I play in a band called Twisted Wheel and we are currently two-thirds of the way through a 30 date, UK wide tour. If you weren’t in Account Management what would you love to be doing? I’d love to be a successful touring musician, able to travel the world and meet new people. Jimi Hendrix and my mum (an unusual combination I know). My mum has worked for the NHS for 35 years; her work ethic and commitment to our family inspires me every day. Jimi was a musical revolutionary. Anyone who tries something different and treads their own path away from the flock, is an inspiration in my view. 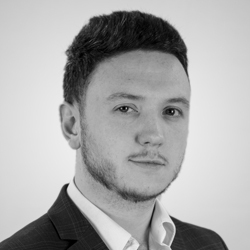 Richard works in the Public Sector Account Management team, assisting clients with their multilingual requirements. Outside of work, he teaches guitar and plays in a band, Twisted Wheel.